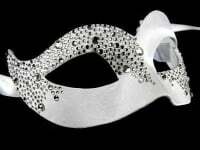 Look stunning and feel gorgeous in this Murano Strass Mask for ladies. Brought to you in black, the Murano Strass features intricate macramé lace as a setting for the glimmering Swarovski crystals and beads. Create a party glamour look to co-ordinate with the chosen theme of your masquerade ball, black tie event or wedding. The Murano is the masquerade costume statement you’re looking for – luxury with a subtle extravagance. Lightweight, the Murano is easy to wear. Satin ties allow you to easily adjust the mask to fit, keeping it in place all night. If you are wondering what makes customers choose real Venetian for their special occasion celebration, it is because they prefer the quality and authenticity. This mask comes with a Certificate of Authenticity which tells you it has been made by hand, in Venice, by craftsmen following a tradition sustained through the centuries. Apprentices today learn and practice this age old craft. Also known as the Mascherari, they become well-respected for their mask making skills and continue to create the elaborate masks modelled every year at the annual carnival. The Carnivale di Venezia welcomes over 3 million people to the city every year for the world famous celebrations. Everyone wants to wear a masquerade costume, and it’s the elaborate masks which signify the tradition. And it’s a tradition which has been popular since medieval times. First worn for practical reasons when Venetians wanted more privacy in an overcrowded city, the mask eventually became a Carnival icon and the Carnival became the most important event on the Venice calendar. Nothing stopped the Carnival – until Austria took over the city in the 18th century. It was to be a further 2 centuries until the Carnival was revived. And after that one time, it has gained in popularity across the world ever since. 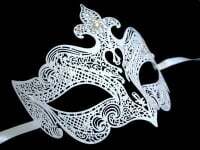 Why not order your Venetian mask today? We offer free delivery to your UK address.